Born in Toyko. Graduated from Tokyo Higher Technical School. Studied mokuhan under Onchi Koshiro and Hiratsuka Un’ichi from 1923. Also studied commercial arts with Hamada Masuji. 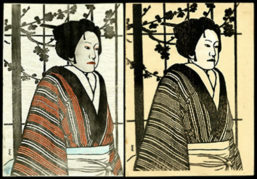 Exhibited with Nihon Sosaku-Hanga Kyokai beginning 1924; member of Nihon Hanga Kyokai from 1932. Member of Kokugakai, Shun’yokai, and Ichimokukai. Contributed to HANGA, Shi to hanga, Ichimokushu, and Kitsutsuki. After World War II he specialized in highly stylized prints of cats. Represented in international competitions including Paris, Toyko, and Lugano biennales. ** Taken in whole, or in part, with permission from: Merritt, Helen and Nanako Yamada. Guide to Modern Japanese Woodblock Prints: 1900-1975. University of Hawaii Press: Honolulu. 1992.